This was my first time seeing a river being worshipped. I was in Hoshangabad, India, with office mates and Friends of the Yamuna River for a workshop on natural farming. The Narmada River was nearby the farm where we stayed, and the group woke early to go for a morning bath. I joined their excursion. I had no intention of bathing, knowing the water quality of rivers in India, but I wanted to see the river – and I was amazed. Massive stone steps lowered to the wide blue river. 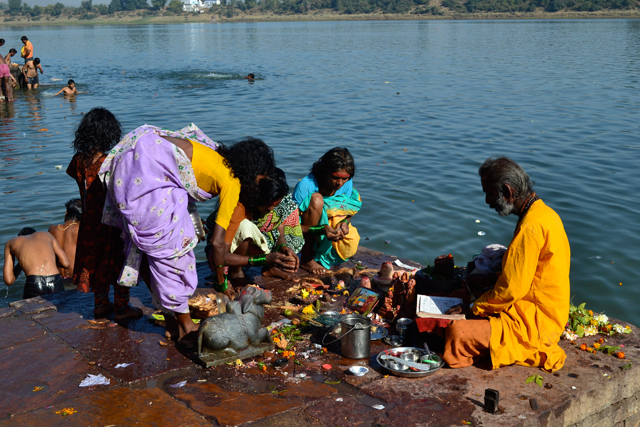 At seven in the morning the steps and platforms were crowded with people washing clothes, themselves, and performing ritual offerings or “pooja” to the Narmada goddess, as seen here. In the Hindu religion, the Narmada is considered so holy that one needs to only glance at the river to remove a lifetime of sins. Seeing this river life, it finally clicked how the groups’ efforts to clean the Yamuna River, was as much about improving the environment as it was a spiritual endeavor. This scene captured a river so alive in the people at its banks that I too felt the divide between a physical river and spiritual body dissolve. 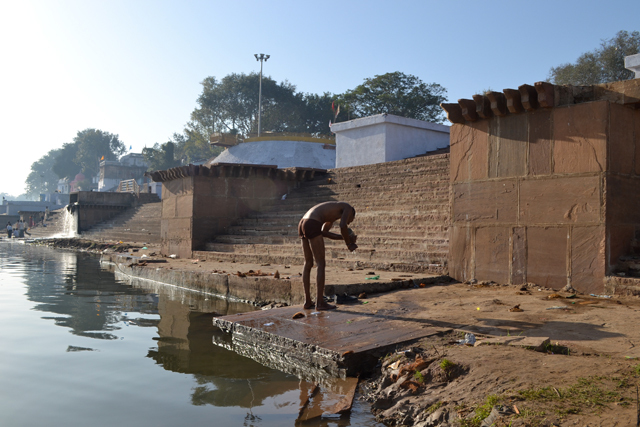 But just steps from the scene of the pooja offering, I saw this man bathing, downstream from a nallah sewage outfall, at the far left of the photo. It became clear to me how there remains a disconnect between worship and reverence for a river and knowledge or acceptance of man-made sources of pollution, and threats to public health. As Haberman writes in River of Love in an Age of Pollution, in Hindu culture, a river in a spiritual sense can never become “polluted,” never considered impure – so translating western beliefs that a river is dirty is not equivalent. Cultural beliefs shape language, and also need to help frame the solutions. Our group took a small boat from these steps to the opposite bank of the river, in order to bathe away from the crowds and sewer outfalls. The only two others from our group who chose not to bathe, aside from myself, were doctors. Linda Ciesielski is a MIT Master of City Planning 2011 graduate, who spent four months of 2012 in northern India working with a small environmental NGO on issues surrounding the Yamuna River. This post is part of the Fresh Eye Friday photo series. Learn how to submit your own Fresh Eye.